KOLWEZI, DEMOCRATIC REPUBLIC OF CONGO – Ivanhoe Mines (TSX: IVN; OTCQX: IVPAF) Executive Chairman Robert Friedland and Chief Executive Officer Lars-Eric Johansson announced today that assays received for Kakula West discovery hole DD1124 have verified a high-grade interval of 5.83% copper over 8.86 metres at a 2.5% cut-off, including a 6.17-metre interval of 6.84% copper. 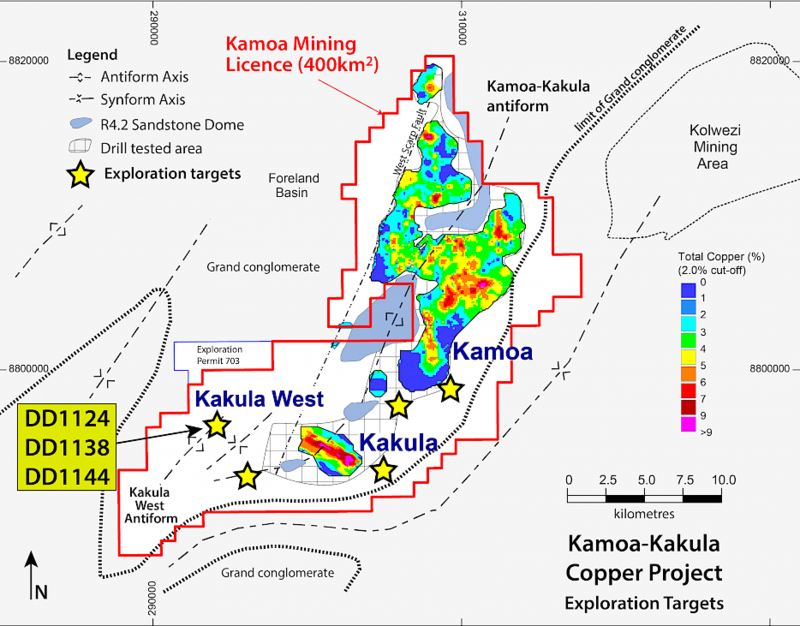 The assay results confirm that Kakula West is another high-grade copper discovery on the company’s Tier One Kamoa-Kakula copper project in the Democratic Republic of Congo (DRC). The results further reinforce the exceptional continuity of high-grade copper mineralization at Kakula along the strike of the well-mineralized trend. DD1124 was drilled 3.8 kilometres west of the current limit of resource delineation drilling on the central section of Kakula. Mr. Friedland and Mr. Johansson also announced today that two new step-out holes at Kakula West – DD1138 and DD1144, drilled 400 and 800 metres respectively west of hole DD1124 and along the strike of the mineralized trend – also have intersected relatively shallow, Kakula-style, chalcocite-rich copper mineralization. 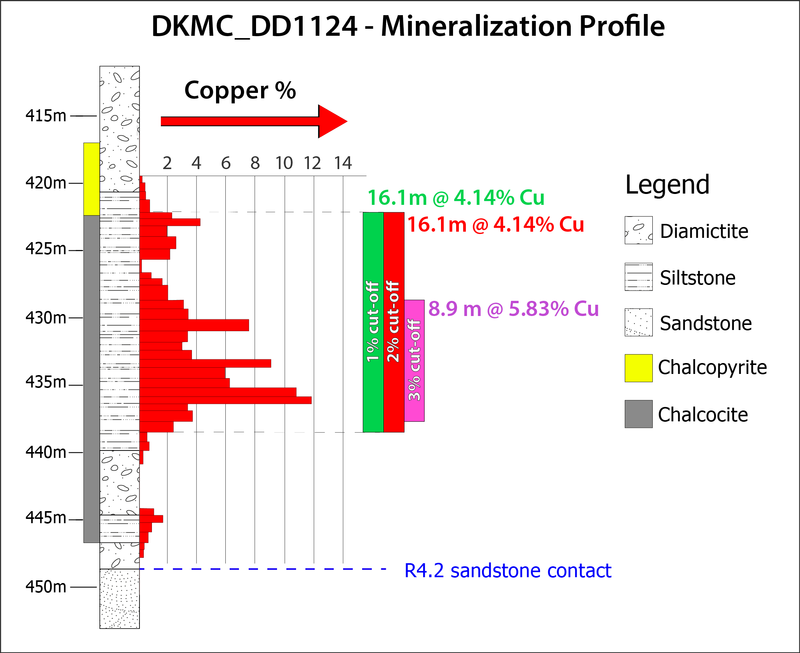 Holes DD1138 and DD1144 have further extended the overall length of the known copper-rich mineralized system at Kakula by another 800 metres, to a total of approximately 11 kilometres. 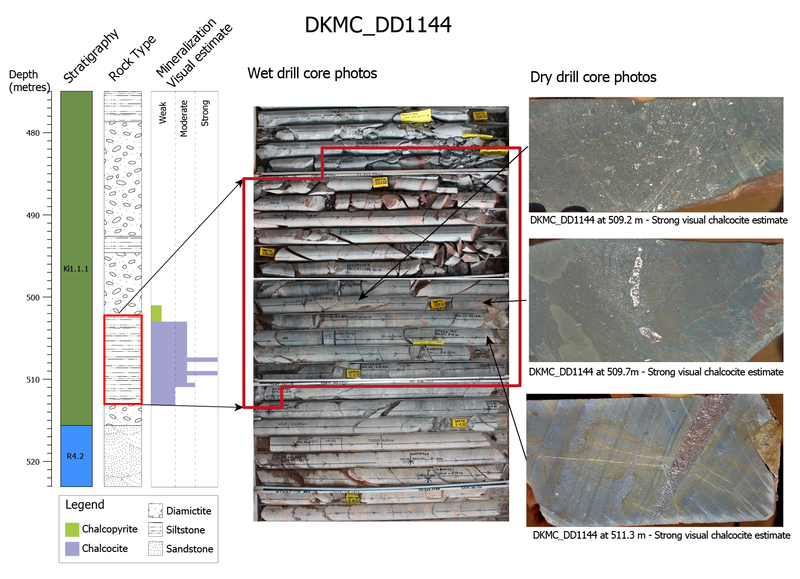 The mineralization encountered in DD1138 and DD1144 is similar to the mineralization intersected in earlier drilling into the high-grade core of the Kakula Discovery, which is approximately 10 kilometres to the east. “We’re thrilled with initial drilling results at Kakula West,” said Mr. Friedland. Assays show that DD1124 intersected 8.86 metres (true width) of 5.83% copper at a 3.0% copper cut-off, beginning at a downhole depth of 428.70 metres; 8.86 metres (true width) of 5.83% copper at a 2.5% copper cut-off; 16.05 metres (true width) of 4.14% copper at a 2.0% copper cut-off; and 16.05 metres (true width) of 4.14% copper at a 1.0% copper cut-off. DD1124’s best six-metre intercept was 6.17 metres (true width) at 6.84% copper. Figure 7 shows a strip log of DD1124 with assay grades and composites. Table 1 shows assay grades for DD1124 at a range of cut-offs. DD1138, drilled 400 metres west of DD1124, intersected a zone of moderate-to-strong chalcocite mineralization six to seven metres thick, beginning at a downhole depth of 565.5 metres. Mineralization is hosted in a laminated siltstone horizon, typical of Kakula-style mineralization seen elsewhere at Kakula. The siltstone was separated from the Roan footwall sandstone by a sandy diamictite unit (see geology log and pictures of core in Figure 8). 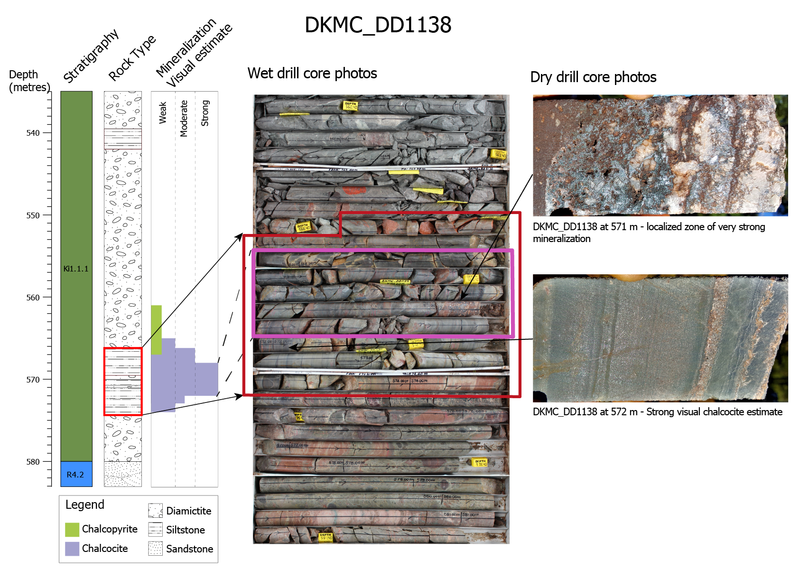 DD1144, drilled 800 metres west of DD1124, intersected similar geology and mineralization to DD1138 with approximately ten metres of moderate chalcocite mineralization, including more strongly mineralized zones starting at a downhole depth of 502 metres and hosted in a laminated siltstone unit (see geology log and pictures of core in Figure 9). Assay results for holes DD1138 and DD1144 are expected in approximately two to three weeks. 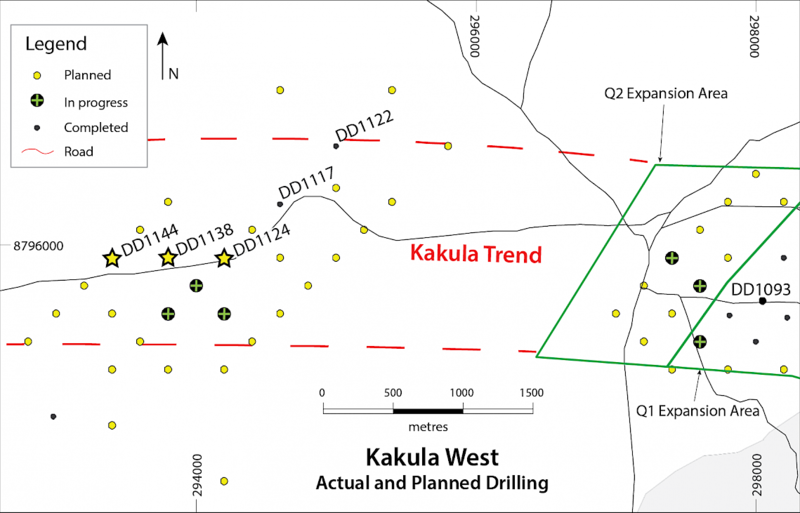 The continuing drilling successes mean that the Kakula Discovery has grown to become approximately 6.8 kilometres longer than the deposit’s 4.1-kilometre strike length that was used to calculate the initial Kakula resource estimate in October 2016. A new resource estimate for the eastern section of Kakula, covering a strike length of approximately 6.3 kilometres, is expected to be ready in May 2017. The Kamoa-Kakula Project, a joint venture between Ivanhoe Mines, Zijin Mining and the DRC government, is near the mining centre of Kolwezi on the Central African Copperbelt in the DRC. 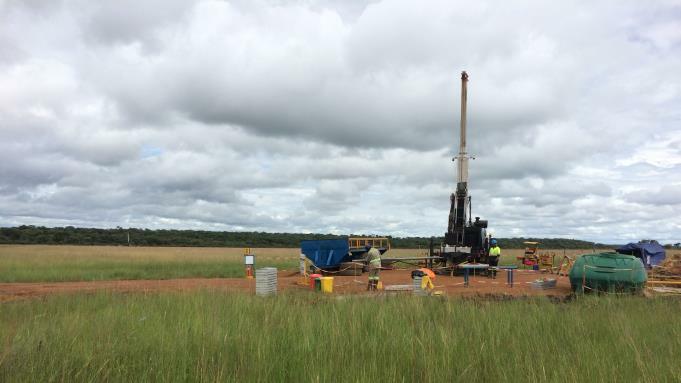 Fourteen rigs are drilling at Kakula. Three rigs are extending the Kakula West discovery area; one is working in the far southeastern area of Kakula; six are extending resources at the northwestern extent of the inferred resource area; two are drilling infill holes close to the centre of Kakula; and two are drilling wedge holes for metallurgical testwork in the Kakula Indicated Resource area (see figures 1 and 2). More than 69,000 metres have been drilled at Kakula since May 2016. The Kakula Discovery remains open along a westerly-southeasterly strike (see Figure 2). Mr. Friedland said that rigs will be reallocated to Kakula West and other high-priority exploration targets elsewhere on the approximately 400-square-kilometre Kamoa-Kakula Project once the resource delineation drilling is completed at the eastern section of the Kakula Deposit. “With the approaching onset of the dry season in the DRC, we also will have the ability to move the rigs to exploration targets that were not accessible during the rainy season. We believe there is excellent geological potential to make other Kakula-type discoveries in the area,” he added. Mr. Friedland also noted that strategic discussions concerning Ivanhoe Mines and its projects are continuing with several significant mining companies and investors across Asia, Europe, Africa and elsewhere. Several investors that have expressed interest have no material limit on the provision of capital. There can be no assurance that the company will pursue any transaction or that a transaction, if pursued, will be completed. Given the substantial increase in investor interest following the remarkable growth of the Kakula Discovery, the company has increased the frequency of organized visits for investors and banking analysts to its three mine development projects, including the massive exploration program at Kakula. Mr. Johansson said it is important for analysts and investors to gain a first-hand understanding of the progress being made at all of Ivanhoe’s projects and the scale of the Kakula Discovery. A group of analysts completed a visit last week; the next scheduled visit to the sites is May 18 to 21. Ivanhoe and Zijin Mining will host a one-day tour of the Kamoa-Kakula Project on June 22 for some of the delegates to the DRC Mining Conference in Lubumbashi. 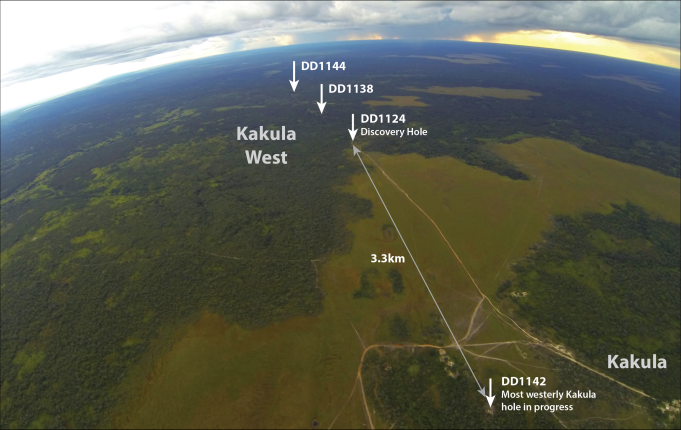 current target areas and location of Kakula West Discovery. step-out holes, DD1138 and DD1144. and the two new 400-metre step-out holes, DD1138 and DD1144. Figure 4. View to west, showing two drilling rigs at the Kakula Discovery. showing drilling completed to date and composites at a 3.0% copper cut-off. Exploration drilling is ongoing over a wide area at Kakula West to establish the geometry of the well-mineralized zone. Assays were received for a second hole, DD1117, drilled 500 metres northeast of DD1124. DD1117 intersected 2.94 metres (true width) of 2.95% copper, at a 3.0% cut-off, from a downhole depth of 491.18 metres, and 3.61 metres of 2.60% copper, at a 1.0% cut-off. 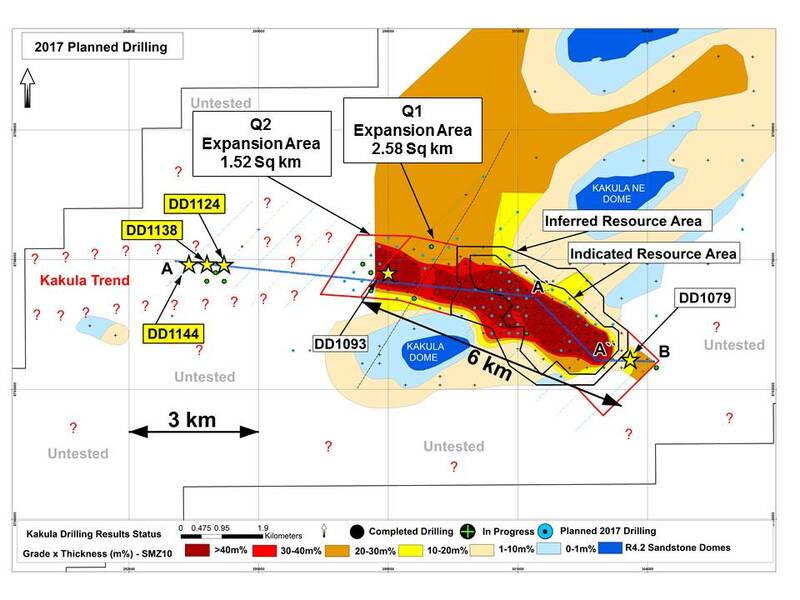 This hole may define the northern edge of the strong copper mineralization as it trends west-southwest, although it is important that mineralization in DD1117 is associated with a 17-metre thick siltstone unit, suggesting the prospectivity of this northern zone remains high. and a typical Kakula-style mineralization profile. profile, and pictures of chalcocite-rich drill core. Table 1. Assay results received for Kakula West drill holes to April 7, 2017. Table 2. Collars for Kakula West drill holes completed to April 7, 2017. Ivanhoe Mines maintains a comprehensive chain of custody and QA-QC program on assays from its Kamoa-Kakula Project. Half-sawn core is processed at Kamoa-Kakula’s on-site preparation laboratory and prepared samples then are shipped by secure courier to Bureau Veritas Minerals (BVM) Laboratories in Australia, an ISO17025-accredited facility. Copper assays are determined at BVM by mixed-acid digestion with ICP finish. Industry-standard certified reference materials and blanks are inserted into the sample stream prior to dispatch to BVM. For detailed information about assay methods and data verification measures used to support the scientific and technical information, please refer to the January 20, 2017 technical report on the Kamoa-Kakula Project titled “Kakula 2016 Preliminary Economic Assessment" on the SEDAR profile of Ivanhoe Mines at www.sedar.com and on the Ivanhoe Mines website at www.ivanhoemines.com. Ivanhoe Mines is advancing its three principal projects in Sub-Saharan Africa: Mine development at the Platreef platinum-palladium-gold-nickel-copper discovery on the Northern Limb of South Africa’s Bushveld Complex; mine development and exploration at the Kamoa-Kakula copper project on the Central African Copperbelt in the DRC; and upgrading at the historic, high-grade Kipushi zinc-copper-silver-germanium mine, also on the DRC’s Copperbelt. For details, visit www.ivanhoemines.com. Certain statements in this release constitute “forward-looking statements” or “forward-looking information” within the meaning of applicable securities laws, including without limitation, the timing and results of: (1) statements regarding a new resource estimate for the eastern section of Kakula is expected to be ready in May 2017; (2) statements regarding expectations that Kakula West is quickly emerging as a near-surface source of high-grade copper mineralization that might be incorporated into the early years of the Kamoa-Kakula mine plan; (3) statements regarding Ivanhoe’s plans to aggressively delineate the full extent of the mineralization at Kakula West; (4) statements regarding plans to soon begin testing high-priority satellite drill targets; (5) statements regarding Ivanhoe’s belief that there is excellent geological potential to make other Kakula-type discoveries in the Kamoa-Kakula Project area; and (6) statements regarding ongoing strategic discussions concerning Ivanhoe Mines and its projects with several significant mining companies and investors across Asia, Europe, Africa and elsewhere.